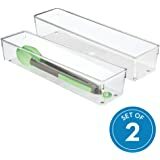 Amazon's Choice for "clear drawer organizer"
USE AROUND YOUR HOME: Not just for the kitchen – organize utility, office, and bathroom drawers too! 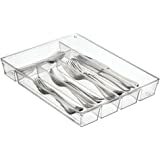 Simple, smart, and customizable, the iDesign In-Drawer Organizer Tray Set will keep your kitchen accessories organized. 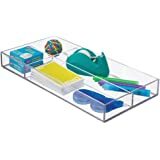 Made from durable plastic, the storage organizers can be used together or separately, and rearranged to suit the exact dimensions of your drawer. 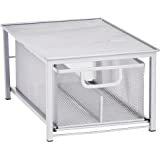 Non-skid rubber feet prevent sliding, keeping the storage trays in place, and the open design allows easy access to the items inside. 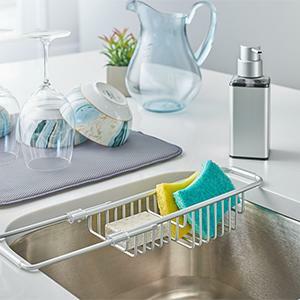 Perfect for the kitchen drawer, the wipe the plastic trays with mild soap and water for a quick clean. 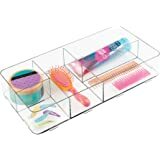 The trays are also ideal for utility, bathroom, office and vanity drawers to organize makeup, stationery, hair accessories or craft supplies. 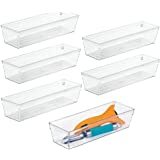 This 6-piece set includes bins in the following sizes: 2—3” x 3” x 2” 1—3” x 6” x 2” 1—3” x 9” x 2” 1—3” x 12” x 2” 1—6” x 6” x 2” With iDesign by InterDesign, you can #LiveSimply every day. 1.0 out of 5 starsGlue/sticker As Bad (or worse!) than described! I thought, how bad could the glue/sticker really be? And are people serious, or just a bunch of whiners? Let me tell you, it is as bad or worse than they described. 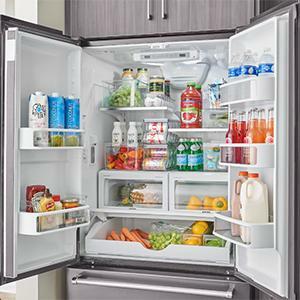 WD-40, Goo-be-Gone, Comet scouring cleanser, vegetable oil, BOILING water -- nothing has removed the glue residue. A royal pain in the arse. On the positive side, I just wrote the company to find out what glue they use-- in case I ever need to reattach the wing to my private plane! 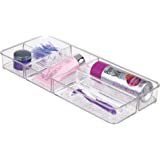 5.0 out of 5 starsPerfect for holding makeup! 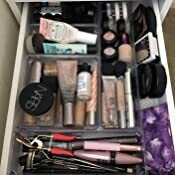 I use the organizers to store some of my makeup and they fit perfectly in my IKEA Alex drawer. 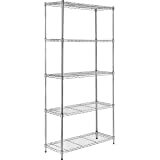 The different sizes give you so many options of what you want it to hold. 1.0 out of 5 starsAdhesive nightmare! Large label in the bottom of 4x4 container was impossible to remove. It came off in layers - eventually leaving a sticky, ugly mess in the bottom of the container. Why would any manufacturer use that kind of adhesive on something that was clearly meant to be removed? All of the containers came wrapped together in a labeled cardboard sleeve. Why the extra super glue sticker? I took a chance on these even after reading other reviews about the sticker problems. 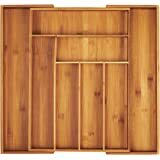 Save your money - too expensive for the hassle and 'damaged' piece. Go with a different product. 3.0 out of 5 starsDon't Forget The Goo Gone With This! 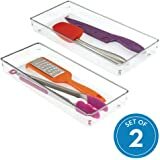 I bought this set to organize my kitchen "gadget" drawer. 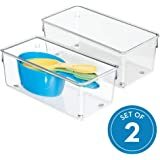 The size of each container is okay - I'm still not entirely certain what is to fit in the 2" x 2" boxes. I've made them work, but it would be nicer if they were bigger. 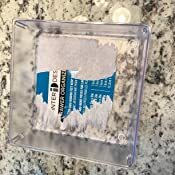 The one thing that was very irritating was the label that was glued into the 4" x 4" box - the glue used could withstand any nature or man made disaster. I tried to peel it off - that didn't work. So I set about scrubbing the remaining label - still no good. 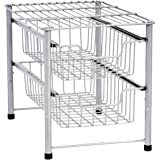 I ended up soaking and scrubbing this for 3 days before I finally made enough headway to be able to use it. And there is still some residue in there! My next step was to go to Home Depot and get some "Goo Gone." Very annoying! All in all, these work for what I want and they are okay. 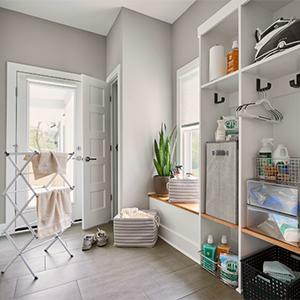 One positive quality is the containers are all separate, so you do not have to use all of them in one place and you can arrange them in a way that will best suit your needs. Just be sure to order some Goo Gone along with your order! 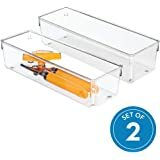 I purchased these for use in my Ikea Alex drawers and they're alright but I far prefer the other products I purchased from byAlegory. These feel a bit flimsy and the packaging included a giant sticker stuck on the bottom which was impossible to remove and left sticky residue all over the place. They weren't ideal for my purposes (organizing makeup) but I can see them being handy elsewhere. 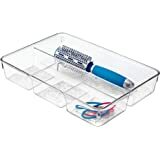 If anyone is looking to use this in the Ikea Alex drawers, know that you'll have a lot of space leftover in the drawer even with all of these in it. I bought this without reading the reviews because I’m familiar with the inter design brand and like it...wish I had read the reviews first! The sticker in the bottom of the large square container does not come out! I don’t understand why they would glue it in the way they have?!? Ugh! So frustrating! 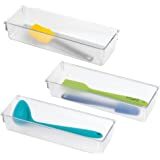 The containers are also not clear, they are more of a frosted plastic which isn’t terrible it just wasn’t what I was expecting. 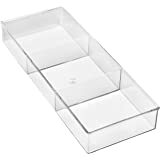 (All the other products I have from them are a clear acrylic) Overall I’m a little disappointed in the product, but not enough to send it back. If I can just get the sticker out they will serve their purpose in my daughters bathroom drawers. 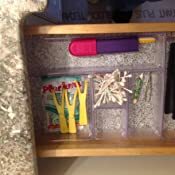 These drawer organizers are perfect for my misc. my art supplies that need containing. They are a little bigger than I expected, however they work perfectly. I was concerned they wouldn't fit into the drawers I need them for, however they are just right and sit right under the top of the drawer without touching or bumping it when I open & close it. 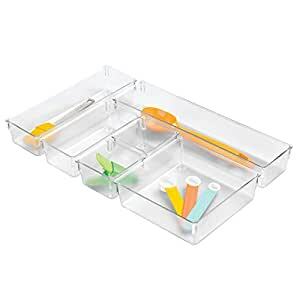 All the compartments are about 2" tall, so if your drawer is shallower than that, I'd pass on these (unless you use them on a counter or dresser drawer or elsewhere). 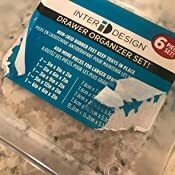 I'd recommend these to anyone needing better drawer organization whether its in your kitchen, bathroom, craft room, art studio, etc! 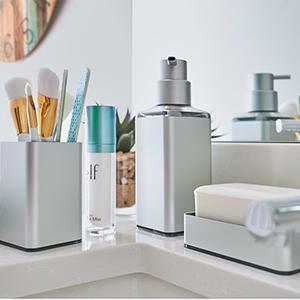 Fits my bathroom vanity perfectly..good quality. Did not give five star because of the sticky label on one of the compartments..best if you set in real HOT water and peel off from inside. Do not get paper wet. 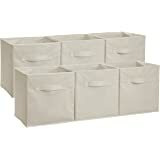 I have ordered 2 more.